Tickets available at www.brownpapertickets.com and 1-800-838-3006. Tickets are $12, general; $10, Earshot members and seniors; $6 for students w/current ID. Andy Clausen. photo by Skyler Skjelset. New York-based composer and trombonist Andy Clausen joins former tongue-in-cheek cross-town rival Riley Mulherkar (now classmates at Juilliard) to present the complete Birth of the Cool suite with a Seattle nonet, including French hornist Tom Varner and alto saxophonist Mark Taylor. Admission is $12 at the door; Earshot Jazz members and seniors receive $2 discount; students pay half price. Tula’s Jazz Club is hosting two International jazz groups back-to-back this week. On Wednesday, June 20, the US-Canada group Tunnel Six performs on their final stop of their North American Tour. The group, which features Seattle trumpeter Chad McCullough and Portland pianist Andrew Oliver will be recording the show for an up-coming CD. The group also features Ben Dietschi (saxophones; Toronto), Brian Seligman (guitar; Toronto), Ron Hynes (bass; Halifax) and Tyson Stubelek (drums; New York). The next night, Thursday, June 21, Earshot Jazz welcomes Icelandic pianist Sunna Gunnlaugs with bassist Thorgrimur Jonsson and drummer Scott McLemore performing in support of Gunnlaugs’ latest release, Long Pair Bond (2011). Gunnlaugs enjoys touring and has performed throughout the United States, Canada, Europe and Japan. Seven releases as a leader have consistently met critical praise. Now living in Iceland, she frequently performs with her Iceland trio featuring bassist Jonsson and drummer McLemore. For reservations for each of these shows, call Tula’s Jazz Club at 206-443-4221. Pianist Orrin Evans is a New York-based pianist who also headlined with his own group at the mainstage concert at the Ballard Jazz Festival the following night. He also appears on the new CD. 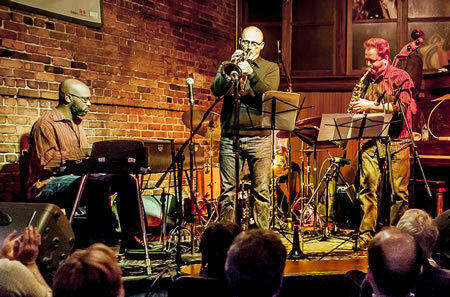 The Ballard Jazz Walk is part of the annual Ballard Jazz Festival and includes a dozen or more venues featuring live jazz, all within walking distance of each other in old Ballard. Over 70 musicians played during the jazz walk and the music and people spilling out of the small clubs along the street provided a very festive atmosphere. The festival is produced by Matt Jorgensen and John Bishop with production coordination by Chad McCullough and supported by the Ballard business community. Jazz Northwest is recorded and produced by Jim Wilke exclusively for 88.5 KPLU and is heard Sundays at 1 PM PDT. A podcast of the program will be available after the broadcast. update: due to a scheduling conflict this show has been cancelled. 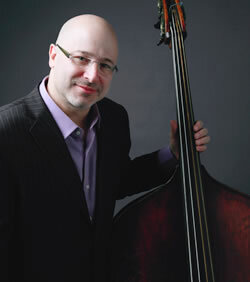 Seattle Jazz Scene is proud to welcome bassist Ben Wolfe and his trio to Seattle for a one-night only performance at the CMA Gallery. On his album devoted to the songs of John Lennon, “All We Are Saying,… ” Seattle-based guitarist Bill Frisell really gets the heartbreaking tenderness and pain of the family songs (“Julia,” “Mother,” “Beautiful Boy”) and Lennon’s yearning for a better world (“Give Peace a Chance,” “Imagine”). The gifted guitarist performs these and more with Tony Scherr (bass), Greg Leisz (steel guitars) and Kenny Wollesen (drums) at 7:30 and 9:30 p.m. Thursday-Saturday and at 7:30 p.m. June 17 at Dimitriou’s Jazz Alley, 2033 Sixth Ave., Seattle; $26.50 (206-441-9729 or www.jazzalley.com). 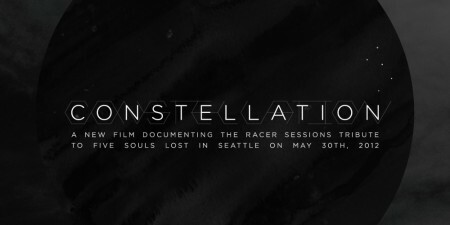 CONSTELLATION, a new film from Table & Chairs documenting the Racer Sessions tribute to those lost in the Seattle shootings on May 30th will be out soon! DVDs of the film are now available for preorder at caferacerconstellation.com, and 100% of the proceeds will go directly to the families of the victims. Thank you for your generosity in advance, and stay tuned for the initial release on Vimeo in the coming days.